We are pleased to announce that Fareham Shopping Centre is close to agreeing terms with a new store to move into the former BHS unit. BHS closed its Fareham store last year after the chain went into administration. It’s expected the new retailer will be ready in time for the Christmas shopping period. A number of improvements have been made to the Shopping Centre to make it more appealing to customers and retailers, including enhancing the internal décor with new lighting and redecoration. Chris Beckerman, Managing Director of Roubaix Group, which owns Fareham Shopping Centre, said: “Since we acquired the centre two years ago, we have been working hard to ensure that there is a vibrant mix of retailers for our customers, and have made a number of improvements in and around the centre to improve the visitor experience. Fareham is a great town, and we are very pleased to be working closely with the Council to bring forward a range of further improvements in the coming months”. A further announcement about the new store is expected by the end of this month. The news comes as figures show Fareham Town centre as a whole continues to perform well and its vacancy rate (the number of empty shops) is below the national average. 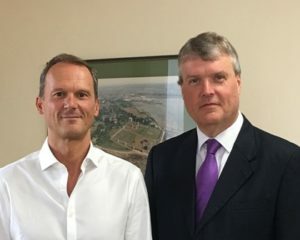 Fareham Borough Council is excited to announce talks are underway about bringing the first scheduled passenger flights to Solent Airport at Daedalus. Regional and City Airports are working closely with Air Alderney to progress this exciting proposal which seeks to create a daily service from the Channel Islands to Solent Airport. The announcement comes in the Airport’s centenary year. If the plans go ahead passengers will be able to board an eight seater Islander plane to take them to the island of Alderney. The manufacturer of the planes, Britten Norman, is actually based at Solent Airport from where the Islander aircraft has operated from for many years. A decision on the new air service is expected in the next few months. Residents of the new Welborne Garden Village will have a health and wellbeing hub on their doorstep within Welborne – that’s the message from Fareham Borough Council and lead NHS commissioner for Welborne, Fareham and Gosport Clinical Commissioning Group, after a recent productive meeting to agree how the authorities would work together. Hampshire CCG Partnership Chief Executive Maggie MacIsaac and Chairman Dr David Chilvers met with Fareham Borough Council Executive Leader Councillor Seán Woodward and Chief Executive Officer Peter Grimwood to begin planning health and wellbeing services for the proposed new community of Welborne. On the agenda for both sides was the growing demand for health services, the difficulty of recruiting new GPs and the innovative ways that technology could be used to help people better manage their own health and communicate with health professionals. Fareham is already one of the areas pioneering web consultations for GPs and a new ‘Same Day’ GP service will be available to 40,000 local people in the autumn to help manage the demands on local GP practices and cut waiting times for patients. Dr David Chilvers, Chairman of the governing board for Fareham and Gosport CCG, said: “The CCG is committed to ensuring local people have a range of high quality, local health services to meet their needs. New technology, an ageing population and a shortage of GPs means that we have to change the way that care is provided in the future to ensure that we can deliver that commitment. Conservative Councillor Seán Woodward said “I am delighted that we have agreed a way forward with the CCG that will bring a health and wellbeing hub to Welborne. There are some exciting opportunities to develop innovative, hi-tech solutions in Welborne which we hope will be attractive to new residents. Fareham Borough Council has created a new draft Corporate Strategy and we want to hear residents’ views on it. We would like to know which priority is the most important to you. You can also tell us if you think we’ve missed something important. A consultation event where you can have your say will take place on Tuesday 5 September, 3 – 7pm, at Ferneham Hall.